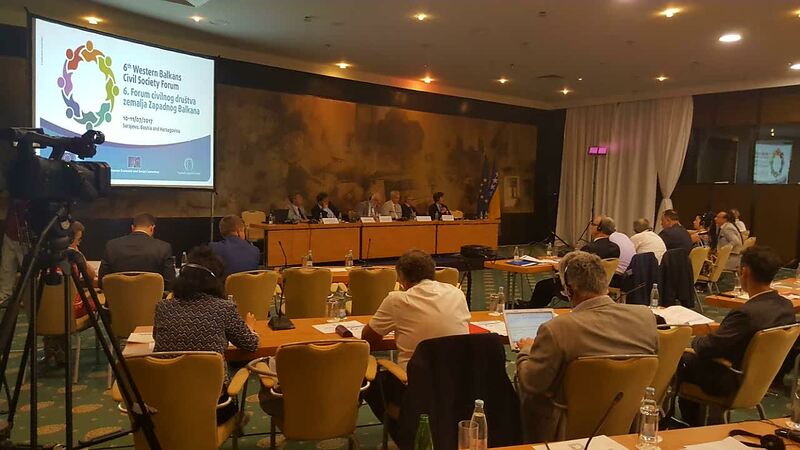 Sarajevo – The Sixth Western Balkans Civil Society Forum, organised by the European Economic and Social Committee (EESC) in cooperation with the Regional Cooperation Council (RCC), opened in Sarajevo today. “Strong, successful economies require strong and vibrant civil societies. Civil society must have a say for the reformation and development of our societies,” said RCC Secretary General, Goran Svilanovic, at the Forum opening. Georges Dassis, EESC President said that EU integration does not mean becoming part of economic organization, but to take part of a body based on solidarity, guaranteeing all kinds of freedoms - freedom of expression, movement, speech, etc. He added that the EESC is in favour of all European countries, including this region, joining the EU. "The stronger the civil societies are, inside and outside Europe, the stronger the democratic institutions are. The same applies to Western Balkans,” emphasized Olaf Deussen, Focal Point for Human Rights at the EU Delegation to Bosnia and Herzegovina. He stressed that EC encourage governments to include civil society and provide them support and capacity building. The main topics on the agenda of the 6th edition of Western Balkans Civil Society Forum is the role of civil society organisations in promoting sustainable growth and employment, migration in the Western Balkans, freedom of expression and media, as well as rights and empowerment of women. The participants are expected to agree and adopt a final declaration with recommendations from civil society organisations tackling the topics discussed at the Forum. The Forum brings together over 100 participants of civil society representatives from the EU and the Western Balkans, as well as representatives of EU institutions, international organisations and governments of the region. The opportunity for the civil society to contribute to the Berlin Process was opened at the Civil Society Forum in Vienna (2015), where the RCC was engaged in the organization of the forum – an initiative which continued to evolve and became an integral part of the Berlin Process. Today civil society organizations from the region are represented in the process, having the opportunity to contribute directly and collaborate with respective governments on the preparation of recommendations.